El Niño couldn’t be more obvious than it is in this sea surface temperature anomaly analysis for Nov. 12, 2015. Graphic courtesy of NOAA. If Beethoven rolled over, he wouldn’t notice, but the Pacific Ocean is overheating at its midsection, a condition known as El Niño because it tends to peak around Christmas. The words translate to “The Child” from Spanish, and refer to Christ. Did I mention we need a better name? All right, we have one — sort of — Southern Oscillation (more properly El Niño/Southern Oscillation or ENSO). But that sounds scary, so we’ll stick with El Niño, even though every time I type it I have to go find the little squiggly thing to put over the n.
El Niño is a warming of the equatorial Pacific Ocean by a mechanism known as a Kelvin wave – which, Lord Kelvin found, deflects in a certain way at a boundary, such as an ocean wave hitting a shore at an angle. But there’s no boundary in the middle of the ocean, you protest. Quite true — there is no physical boundary — but the change of Coriolis force from positive to negative across the equator confines the wave to within a few degrees of the equator. El Niño is characterized by a warming of the surface water across the entire equatorial Pacific with the exception of the extreme western portion. When El Niño was first observed, the main concern was for the anchovy fishery off the coast of Peru: Anchovies thrive in cold water; when the warm water arrives, the fish disappear and the fishery collapses. Now it is known that El Niño has ramifications across the globe — we blame it for rain in the southern US, drought in Australia and India, and all sorts of mischief in between. What Causes An El Niño To Start? Cause and effect, in the case of El Niño, is not as simple as drinking too much alcohol and behaving badly. The atmosphere and oceans are characterized by resonances of many time and distance scales. The simplest way to describe the start of an El Nino is that it is a weakening of the prevailing easterlies in the tropics. This happens every few years, but not on a regular schedule. Imagine the winds blowing at a constant rate from South America towards Asia, pushing the warm surface water westward. Now suppose the east wind suddenly decreases — never mind why; just call it a random variation in the atmosphere. The warm water piled up in the western part of the ocean begins to slosh back east. This eastward slosh is a Kelvin wave, and Lord Kelvin’s computations confine the warmest water near the equator as the wave traverses the ocean until it reaches Peru and disperses the anchovies. Several successive Kelvin waves have produced the current strong El Niño. When the warm water piled up near Indonesia by the tropical easterlies begins to travel east, it would disperse in all directions and dissipate – if not for the Kelvin wave that is produced. Coriolis force, a result of the rotation of the earth, works like this: Any air or water molecule in motion is deflected to the right of its direction of motion in the northern hemisphere and the left in the southern hemisphere. So the warm water cannot escape the equator. Any movement north or south is met by a force in the direction of the equator. Imagine a parcel of wind or water moving north in the northern hemisphere. Because the earth is a sphere, northern latitudes are closer to the axis of rotation than southern ones. Angular momentum is always conserved, so the moving parcel will now be moving faster than the ground beneath it — it appears to be deflected to the east. The same effect (trust me) works for motion in any direction. As a result of the Coriolis force, a Kelvin wave cannot stray far from the equator, and the warm water is locked into a very narrow band. Currently the water in the warmest part of the Pacific is about 3° C, or 5° F above normal. The CPC issued its latest bulletin on El Niño on November 12. There was relatively little change in the prognosis for the El Niño from last month, though a new Kelvin wave appears to be crossing the ocean, ready to reinvigorate the phenomenon and raise the temperature further. It takes about two months for a Kelvin wave to reach South America from the western part of the ocean, and will arrive at the time of the average El Niño maximum. After January, forecasts call for water temperatures to slowly return to normal, and in fact, historically a fairly substantial La Niña (colder than normal water temperatures in the equatorial Pacific) follows a strong El Niño. The CPC report predicts that all of California, particularly southern California, will receive precipitation amounts well above normal this winter. Decoded Science concurs. The ‘Pineapple Express,’ a train of moisture from the deep tropics to California by way of Hawaii, should start to be evident in December. October rainfall was above normal in east Africa. This is typical for an El Niño year. Graphic courtesy of NOAA. Californians will be cheered by this news, but there is a downside component to El Niño rains: Warmer temperatures. In the long run, California is dependent on melting snow-pack for its water. Warmer temperatures may mean more precipitation, but with a smaller percentage of it falling as snow. Some of the El Niño rain will be lost as runoff. 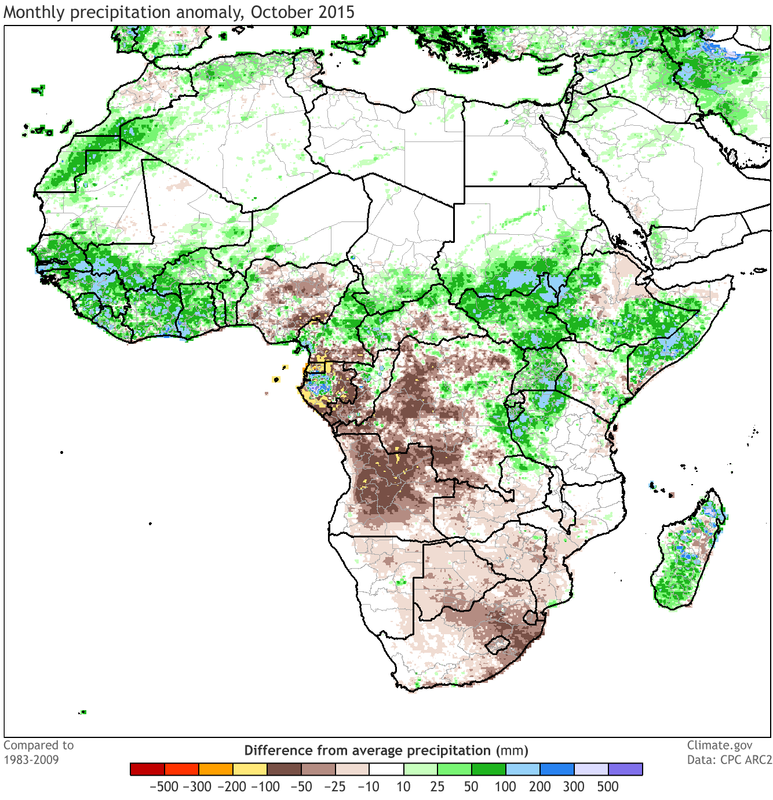 El Niño typically enhances the fall rainfall in eastern Africa, and this October showed a trend to wetter than normal. Some flooding was reported in Somalia. On the other side of the precipitation coin, India’s monsoon rains were about 20% below normal, and parts of Australia are in extreme drought. Both are typically connected to El Niño conditions. When Will El Niño End? Most El Niños peak in December or January and decline into spring, often followed by a period of La Niña, and this is what CPC is forecasting. But with climate change playing serious tricks on our weather, Decoded Science will wait to see if this one ends in the usual way.